The city of Allahabad does not possess an airport of its own. However, you can access the nearest airports at Varanasi, which is 147 km away, and Lucknow airport which is at 210 km from Allahabad. Transportation access to Allahabad is trouble-free due to its rail services, as Allahabad is well connected by trains to most of the other important Indian cities. 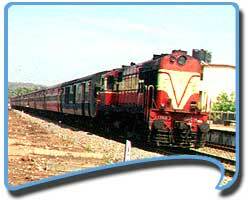 Being situated on the Delhi-Kolkata route it can be comfortably accessed by rail or bus from any part of India. Some of the fastest trains in India like Rajdhani, Magadh, and Shramjeevi connect the city with the metros like Delhi and Kolkata. The average time taken from Kolkata is 15 hours, Delhi 10 hours, and Mumbai 24 hours. A good roadway network connects the different parts of the city of Allahabad. Other cities of the state of Uttar Pradesh are easily reachable by means of road transport. In that case if you are thinking how to reach Allahabad by road, you will have at your disposal plenty of good options. Log on to www.touristplacesinindia.com which gives online information about Transportation Access and booking for India travel tours on your tour to India.